The Q1 2011 BJJ Women’s Open Mat will be held on Sunday, 6 February and will be hosted by Leoni Munslow and our friends at BJJ School, Battersea Academy and is proudly sponsored by Black Eagle. 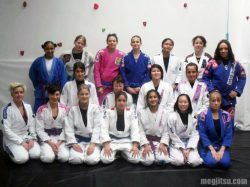 Women, 18 years and over, are encouraged to join our informal session of drilling and sparring. No grappling experience is required and the Open Mat is a great opportunity for seasoned players to train with other women and for women new to BJJ to try out the art in a friendly environment. The Open Mat is free of charge.